Happy Easter everyone! It’s one of my favorite holidays for a few reasons. First and foremost because I love getting together with my family. My cousins and I are slowly having kids so it’s so exciting to get together. Last year my cousin and I were pregnant together, this year my son and her daughter will be able to join my oldest in the Easter egg hunt! It’s our second year hosting in our new house and I enjoy it more than any other holiday because it’s an easy meal for me to plan and make. I make the main course and desserts and everyone else brings the side dishes. Oh and of course because it means Spring is coming, even if it was 78 one day and 2 days later it snowed where I live! That’s New England at it’s finest! So today I decided to bring a dessert to the #SundaySupper table because I’ve been experimenting a lot with baking lately. Cupcakes are by far my favorite thing to make but I wanted to try something different so instead of cupcakes I poured the contents into a sheet pan and cut circles out of them, it didn’t go as planned because I wanted to stack them with a layer of the Peanut Butter whipped topping in between however the sheet pan I used made them just as thick as cupcakes! Soooo I went with it. The whole point of making these was to incorporate a healthier version of peanut butter into the topping. I’m making dessert for my family and we all are trying to eat less sugar and a bit healthier this year so using powdered peanut butter is the way to go! Powdered Peanut Butter?? I know what your thinking, crazy, strange, well it cuts the calories and fat by a TREMENDOUS amount! Does it taste exactly like Peanut Butter, no of course not, but it’s darn close and it’s a great healthy alternative! You can find all different kinds of brands out there, I happened to find mine at Walmart. I also know a lot of health food stores caries and you can buy it on Amazon too. When making regular peanut butter to spread on toast you simply add water, in this recipe you are adding the powder directly to the cool whip and mixing it together to give it that creamy peanut butter taste! In a small bowl, whisk together flour, baking powder, and salt and set aside. Mix milk and vanilla in a measuring cup and set aside. In a large bowl, with an electric mixer, beat butter and sugar until light and fluffy, 3 to 4 minutes. Add eggs one at a time, beating well after each addition. With mixer on low speed, add half of dry ingredients, followed by milk-vanilla mixture, then remaining dry ingredients. Be sure to not over mix here. Divide batter evenly among prepared muffin cups, a 1/4 measuring cup is a great way to make these perfect. Place tin on a rimmed baking sheet; bake until a toothpick inserted in center of a cupcake comes out clean, 20 to 25 minutes. 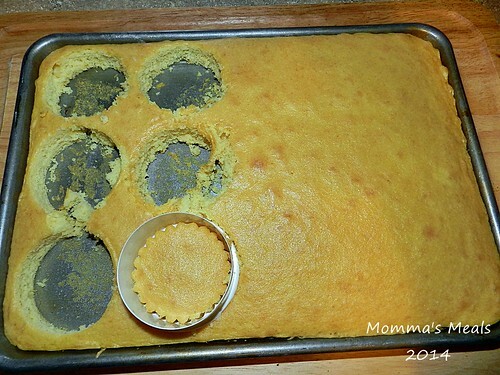 Cool cupcakes 5 minutes in tin, then remove and cool completely before frosting. While the cupcakes cook, add 3 tablespoons of powdered peanut butter to the thawed whipped topping. Just keep stirrung for a few minutes to make sure it mixes well. Frost cupcakes and decorate with M&M’s or any other candies! I also used a plastic bag with the tip snipped to make these pretty instead of frosting by hand. I hope my family enjoys these, feel free to use any cupcake recipe with this topping, for my family I plan on going sugar free! My mom said the sugar free ones were really good!! It just makes me feel a lot better indulging or allowing my kiddo’s to indulge when they are lower in sugar! Trust me, you don’t want to see my three and a half year old after a bunch of sugar!! So cute! I love it and with peanut butter, um yes please! Yummy! 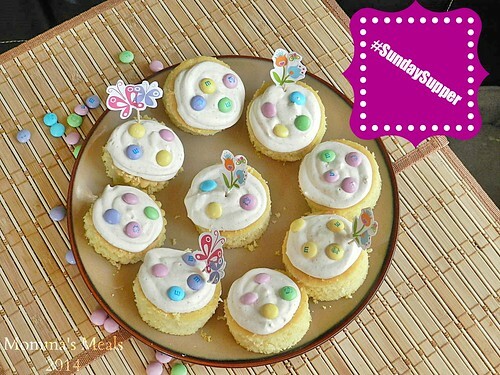 Such a perfect Easter dessert…so festive and yummy!!! Those are adorable, Tammi! I am sure your whole family enjoyed them. Happy Easter! 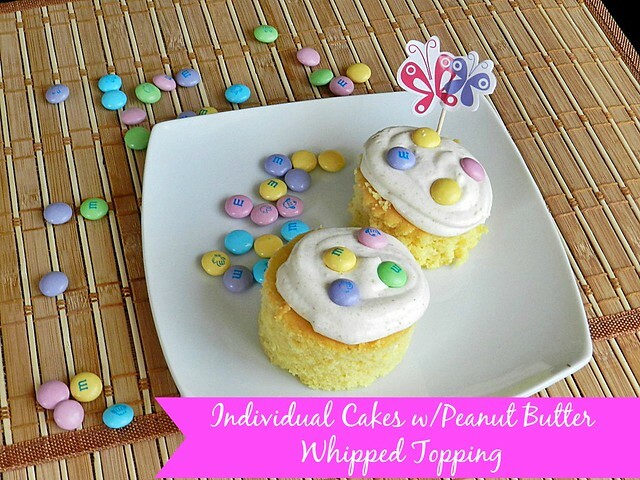 Peanut butter whipped frosting? I am soooooooooo there! Aw, these are sooo cute! I love them, and I bet they are super tasty too. I love peanut butter so I’m totally in for one (or more)! WOW, yes please, with chocolate on top? Aw, they are so sweet, love them!! I have to tell you when I saw the title of your recipe it put a smile on my face. When I was a kid, my Mom used to make me spice cake with peanut butter frosting (it was my favorite kind of cake). Lots of good memories…Your cupcakes look great! Peanut butter whipped frosting — OMG! My mouth is watering…. I keep seeing that powdered pb in the stores and wondered what to do with it. My question has been answered. Make frosting! I’ve only tried the PB2 in a smoothie from my fave smoothie shop, but I would totally try it with whipped frosting. 🙂 Hey, if it’s peanut butter I’ll try it. Especially if cake is involved! Thank you for sharing your recipe with us! There’s something so special about individual desserts. I really love this idea! I’ve never heard of powdered peanut butter – it sounds really interesting and worth trying! ?Your cakes are so cute and festive, love the individual serving size! You should try and find it, I’m loving it and it’s way lower in fat and calories! Great for desserts! Those little cakes are darling! I’ve never heard of powdered peanut butter, but now I’ll be looking for it–must try!